One of just 58 examples built in right-hand drive configuration, this example was sold new to Elton John through H.R. Owen in London. Finished in red with a tan interior, it was fitted with the optional air conditioning and Voxson radio. Cherished throughout its life, it had covered only 9,700 miles from new by the start of 2019, Still original in most respects, it did receive a mechanical overhaul that included an engine-out service and suspension work in 2012. 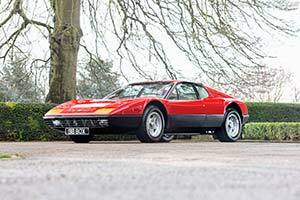 In the spring of 2019, it was consigned to the Bonhams Goodwood Members' Meeting sale.